Since the election of Emmanuel Macron, the president of the rich, and after the onslaught of the government against all sectors in society especially the public services – the railways (the SNCF), pensioners, young people, unemployed – we were expecting the day of action on 22 March to go well. The day of the pensioners’ protest on the 15 March, the countless strikes, walkouts, and struggles taking place every week around the country, had all built up into a successful mobilisation for the 22nd. There were up to half a million on the streets across the country. More than one railway-worker in three was on strike, one primary school teacher out of 4. This day of action was indeed a clear demonstration of anger and of a desire to put an end to the policies that we have seen! If it was not yet as big as the huge demonstrations during the movement against the new labour laws, the atmosphere on the demonstrations and the widespread support from those who did not or could not strike showed that this day of action is already significantly different from those of September-October last year in numerous cities. Many groups of workers went on strike – some for the first time ever, some for the first time in a long time. We saw very diverse groups – much more than the traditional trade union contingents – the presence of young students in the main cities and groups of high school students on the move. The strike was not organised only to fight back against the specific measures of the government but as a way to signal that this is the time to begin the counter-attack and show the determination to plan what happens next at the same time as fighting for the demands of each sector. 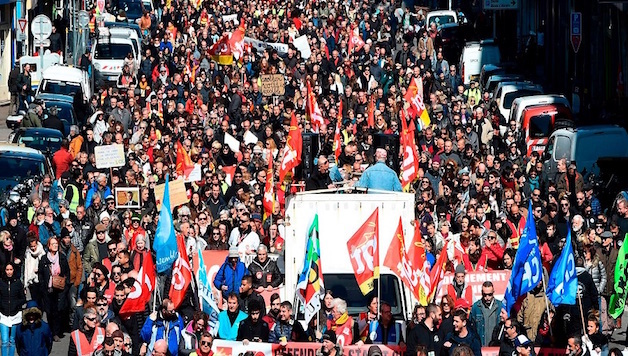 The government and the media, in the hands of their friends the billionaires, have gone to town in doling out tons of propaganda against the SNCF strikers but it did not work! A majority in society supports their fight to keep the railways public. The huge attention given to ‘their’ fight indicates the concern of a growing number of those who went on strike and demonstrated to discuss strategy and an ‘all together’ fight. The presence of contingents of young people on the railway workers protests in Paris indicates a feeling of the need to fight together. But so does the mixture of many different sectors of workers on the marches and the sizeable demonstrations in medium-sized cities and towns despite the cold early Spring weather. Workers in the private sector are being hammered by the labour law ‘reforms’. Public sector workers are suffering privatisation, massive job cuts and budget cuts. Young people are threatened by the thorough-going dismantling of school and higher education. We are all under attack from these policies; we have to mobilise in a united fashion. The coming 3 and 4 of April are the first strike dates of the railway-workers. These dates need to be major days of support and participation in the struggle on the SNCF. The next date for strike action in both the public and the private sectors has been set by the CGT trade union federation for April 19. This date should serve as a step towards building a massive, united all-together strike. During the fiftieth anniversary of the great general strike of May 1968, with its ten million strikers, we can refresh memories by showing what workers and youth are capable of when they are fighting and united!